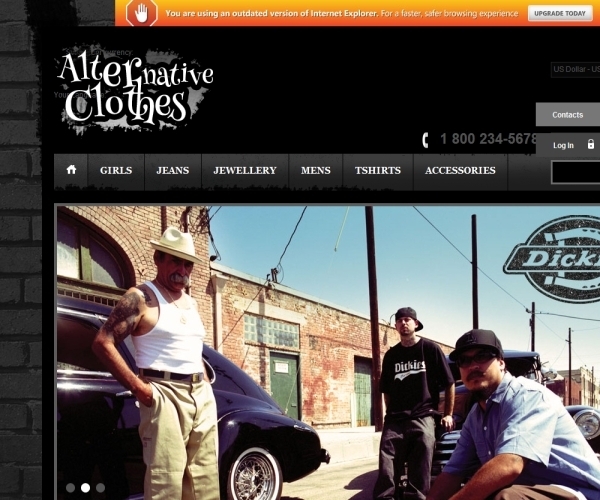 “Alternative Clothes” template from Template-help.com comes with a retro styled black background and color scheme and suits off-beat clothing ranges, fashion accessories, Tee’s etc. The template comes with multiple language and currency options along with an integrated homepage slider where you can show your latest collections, deals etc. Embedded social media links, an opt-in box for newsletter subscription and a contact us page with a built-in message form help users easily stay connected. The black color scheme of the template is a sure way to stylishly showcase your products and attract users. It has a image slider for your featured products and images as well as extensive call to action spaces where you can add promotional and Ad banners. A default 5 column grid can be used for your latest product ranges. Primary navigation is by a multi-level header menu for your different product categories, along with a top menu for account management links. The free spaces in the footer block can also have internal quicklinks. Users can do a quick keyword search from the keyword search box in the header and can use the Advanced Search option for searching with multiple attributes. You can also include sidebar category links, “Shop By” groupings in the. Users can also do a quick keyword search and can use the Advanced Search option to search by multiple attributes. They can also choose between grid and list layout options and select the number of listings to be displayed per page. Individual product pages come with support for multiple images along with a Cloud Zoom feature for image magnification as well as embedded social media links. The tabbed content extension helps you include Reviews, Product tags, Description etc all within the same content space. Registered users can submit reviews, add products to a wishlist and can also compare products. The checkout page has a shipping and tax estimator extension where users can get an estimate by mentioning their location details, and can also redeem coupons. The Alternative Clothing premium Magento template is priced at $140 and comes with included PSD files and requires Magento community edition 1.7.0.x and higher.